Mellbreak dominated the western shores of Crummock Water, running alongside the lake for almost its entire length, with high crags looming above the water and gentle lower slopes that carry one of the best lakeshore paths. Mellbreak is a rare example of a Lakeland fell that isn't connected to any other high ground. To the north is the Loweswater valley, to the east Crummock Water and to the west Mosedale. The smallest drop is in the south, but even here the pass between Mosedale and the valley of Black Beck only reaches 800ft, half the height of the southern summit. 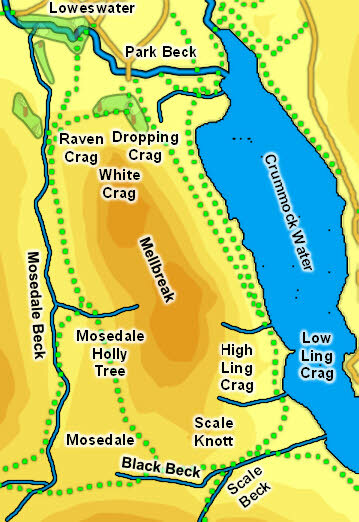 Mosedale's most unusual feature is the single holy tree in the middle of the valley, such an expected sight that the OS directly names it on the 1:25,000 scale maps. On the eastern slopes Low Ling Crag is a super picnic site, a narrow peninsula jutting out into Crummock Water, with little rocky beaches and great views of the lake and the fells. The northern face is the most dramatic - here the two steep sides come together to produce a ridge ending in crags. Seen from below the top of these crags produce the effect of a clear peak, giving Mellbreak a more impressive summit than it really possesses. This is the view of the fell as seen from Loweswater or when approaching from the Vale of Lorton. There are three standard routes of ascent of Mellbreak. The easiest is from the south - follow the path up Black Beck, cross the beck, then climb up alongside a wall. When this path reaches a wall that runs across the southern end of the fell it splits - the left hand branch goes into Mosedale, the right-hand branch runs alongside the wall for a bit then turns north and runs up to the southern summit. The second route climbs up one of several alternative paths that run from Mosedale to the col between the two summits, joining the path between the two in the dip. The third route (and the only one I haven't tried) heads up the dramatic northern front of the fell, starting in the north-west to get above the lower crags then reaching the northern ridge and following it to the top. This route is clearly visible from the Loweswater area, and I am told is not as bad as it looks! We have a circular walk that passes along the eastern flank, climbs the southern slopes to reach the summit of Mellbreak then drops down the path between the saddle to reach Mosedale. Mellbreak has two summits separated by two thirds of a mile. The southern summit is the higher of the two, although only by a few feet, but the northern summit has the better location, just above the north-western crags. The summit area itself is a large grassy sheep pasture, with a gentle dip between the two summits, totally different in character to the steeply sloped sides. Mellbreak doesn't give birth to any named streams, although a number of watercourses do form on the steep west and eastern slopes (more after heavy rain). The fell is bordered to the west by Mosedale Beck, to the south by Black Beck then Scale Beck, to the east by Crummock Water and to the north by Park Beck, on its way from Loweswater to Crummock Water. Mellbreak has no named tarns, but there is a small pool just to the north of the southern summit. A number of historic ruins can be found around the northern end of the fell. The 'Peel' marked on the OS map is the easiest to reach, but is probably an abandoned farm rather than a fortification, and the earthworks nearby look to be rather older than the medieval period.